Good Morning and welcome to the umpteenth edition of What I Ate Wednesday here at BCDC! So many of the people who link up with Jenn at Peas & Crayons seem to know how many WIAW’s they’ve done. I do not. I just know that I show up Whenever possible and yammer on about food and stalk what other people eat over at P & C. You should take the trip over there too. I get such great ideas over there! I know it’s no longer Love your Veggies month but it’s Always love your veggies month here, so I’m sticking with it. I’ve titled this post Old and New because there are things here that you’ve seen before and some wonderful new things. First the most exciting new. Ralph and I went to dinner on Friday night with some ladies I used to work with. It’s always fun but we went to a new place this time. It’s at a semi-local mall and it’s called Firesides. I had checked it on-line and knew I’d be Ok for food choices. I love when I have dinner at a restaurant where I don’t only have one choice. 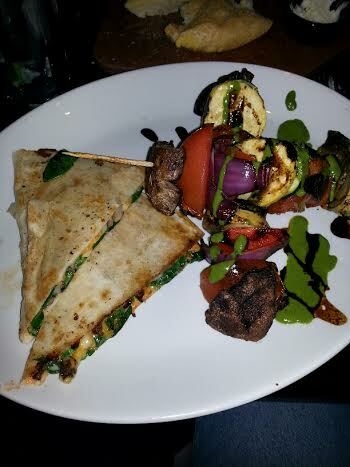 This was listed as a Veggie Kabob. Portobello mushroom, red pepper, tomato and red onion grilled on two kabobs. Half a quesadilla with spinach, pepper jack cheese and something else that I forget inside. I think that was pesto aioli drizzled around. It was SO good and I was very satisfied. I wish the restaurant was closer because I’d go again for this. Everyone was pleased with their choices. 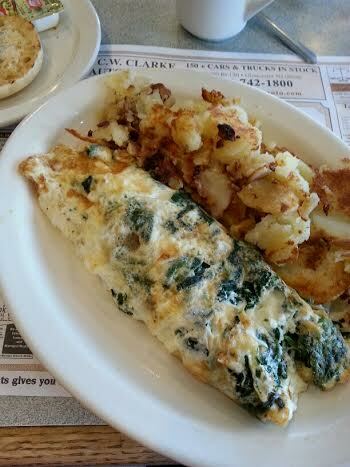 What would WIAW at BCDC be without a diner omelette. You’re welcome, Meghan! This was spinach and feta cheese. I splurged and had the potatoes although I probably only ate a third of them, and an English muffin. Yummy! I so sick of saying this but…Monday we had a snowstorm!!! Hopefully the last for the year. I was tired of complaining and tired of hearing myself complain. Since for some reason I woke up at 4 am, I got to work early on some cooking. I needed to make my Weight Watchers veggie soup for the week and I wanted to cook up some lentils. I also wanted to try an experiment. As a very long time vegetarian, I’m starting to lose my powers of cooking meaty things. I had seen a crock pot recipe for beef stew. It seemed simple and I could deal with the meat without touching it. All of these things led to this on Monday during the snowstorm. Left is the beef stew, center is the lentils and on the right is the WW veggie soup. I had so much fun!! The good news is that Ralph loved the beef stew. It’s a good thing, too because there is a LOT of it!! I was excited because it really was pretty simple. I put the lentils to use for dinner. I had leftover salad from a big salad I had made to take to my sister’s house on Saturday. 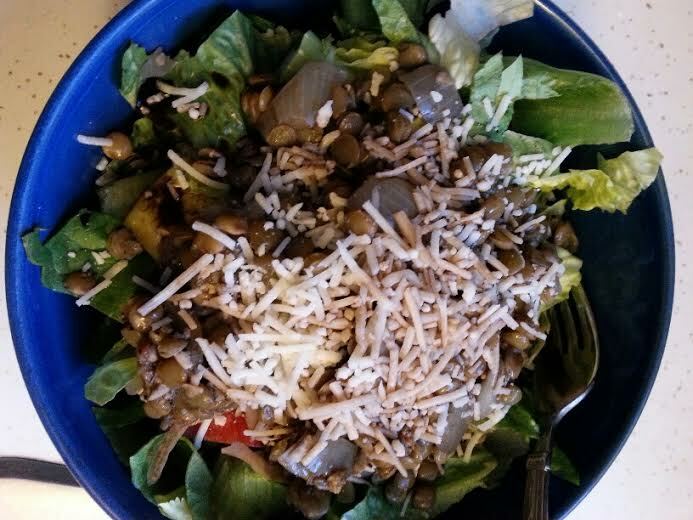 I topped it with lentils, parmesan cheese and some balsamic vinegar. This was very tasty and surprisingly filling. I love cooking lentils this way. They go a long way and they are so good. That’s What I Ate Wednesday for me today. Not sure I can top that three crock pot trick. My other big one is in New Mexico. I only have one other small one. Guess I’ll have to wait until I get to New Mexico to go Five for Five! That dinner omelet sounds amazing! I love lentils! Do you have recipes for your crockpot meals? They sound great! Thanks for visiting, Yuliya! The lentils are just an onion, garlic, Mrs. Dash (salt free seasoning), a cup of lentils and veggie broth to cover by about 2-3 inches. Then depending on your crock pot, 3 or 4 hours cooking on high. The veggie soup is based on a Weight Watchers recipe. I’ll get the recipe together and post it in a few days. Please check back and thanks for visiting!! I am SO ready for the snow to go away. Have a great day, Liz! 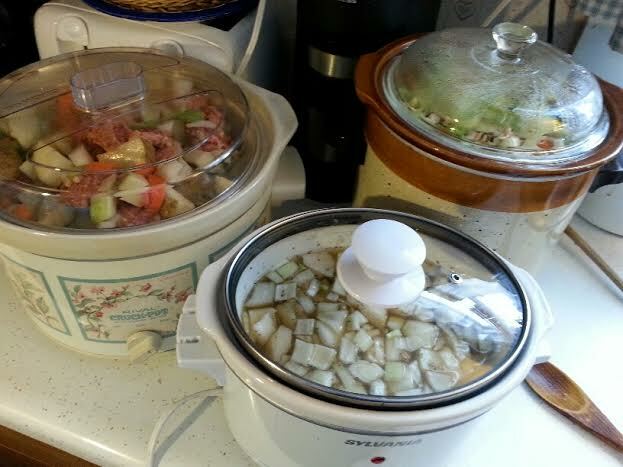 Three Crock pots at once. All hail Queen Fran. I was so impressed I almost missed the diner omelette. Almost. Meal number one looks pretty spectacular too, and I’m with you. Go away winter. No more. Yes, three crock pots. I was pretty impressed myself. I was really impressed that Ralph liked the beef stew! It was so easy and he’s been eating all week. Now I’ve got to find something else to top myself with!